Is it normal to have electricity? Mr. Taiji Sato, the leader of the funk rock band, "Theatre Brook", and THE SOLAR BUDOKAN project. "You can't die a musician without having played at the Budokan." 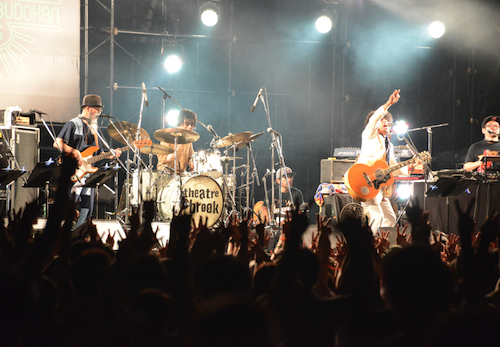 When the Great East Japan Earthquake struck, the band, Theatre Brook, was in the midst of preparing for a live performance at the Budokan. 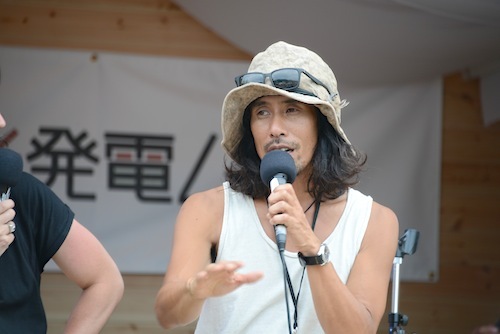 Right after the Great East Japan Earthquake, Mr. Taiji Sato launched a recovery/reconstruction event and began delivering relief supplies to afflicted areas. In the wake of the crisis, a mood of self-restraint had spread across the nation. 3.11 - in a blink of an eye, the world had changed. The dream to perform at the Budokan was still alive, but organizing a conventional concert would be meaningless. He began to think, "If only there was a new way, for me and for everyone." That is when he came up with the dea to "power the entire concert with solar energy. "And that is how THE SOLAR BUDOKAN began. But in the beginning, there was much resistant to this simple, yet revolutionary idea; many people said this would never be possible. 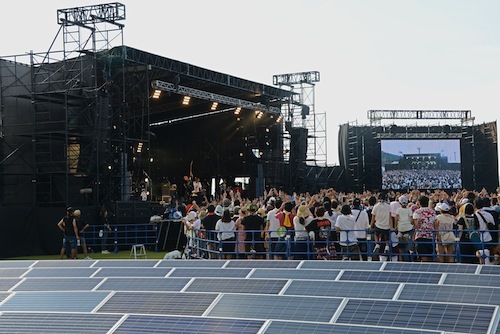 Small events, for about 200 people, have been powered by solar energy, but an event at the Budokan, a venue that can hold more than 10,000 people, had never been before powered entirely by sunlight. So such a reaction was to be expected. But in December 2012, Mr. Taiji Saito made this a reality. December 20, 2012 - THE SOLAR BUDOKAN ended successfully at the Nippon Budokan in Tokyo (photograph provided by: THE SOLAR BUDOKAN). From looking for companies that would support this idea and become a sponsor, to installation and wiring of storage batteries and solar panels - everything was new to him, and he laughingly remembers that "The people working on site had a pretty rough time because the specs of the storage batteries we received from various companies were all different, and the cables we had gotten ready didn't fit." But the staff working on this groundbreaking project must have been filled with great passion and expectations for the future. On stage, when he finished the concert at the Budokan, it didn't feel as though it was the end. It felt like the beginning. Even at the after party, the members had already begun exchanging ideas for the next event. There was one company that was especially enthusiastic. From the inaugural year, this company wanted to really help, and sent passionate messages from the "contact page" on the homepage. This company, Chuo Bussan Co., Ltd., is the supplier of the main battery system, "enenova storage battery" in Nakatsugawa. Looking back, Mr. Sato talked about the early days of THE SOLAR BUDOKAN. 目次へ移動 Being guided to "Nakatsugawa"
The following year, in 2013, they changed the venue from the Budokan to outdoors, and that is when the "Nakatsugawa THE SOLAR BUDOKAN" was born. In Japan, Nakatsugawa is the birthplace of outdoor festivals, and it is also a strong advocate of the abolishment of nuclear weapons. Perhaps it is because of this background, but the people in the region are very cooperative. "As you would expect, the Folk Jamboree is a point of pride for people of the region, and every year I feel that it's an important part of their history. It just so happened that Chuo Bussan was also based in Nakatsugawa and that's why we decided to have the concert here, but I think this place is destined to play a special role." A huge crowd gathering at the venue. A rainbow colored balloon began to climb high into the clear blue sky. (Photograph provided by: THE SOLAR BUDOKAN). So began the "Nakatsugawa THE SOLAR BUDOKAN" and on September 10, 11, 2016, it celebrated its 4th anniversary. 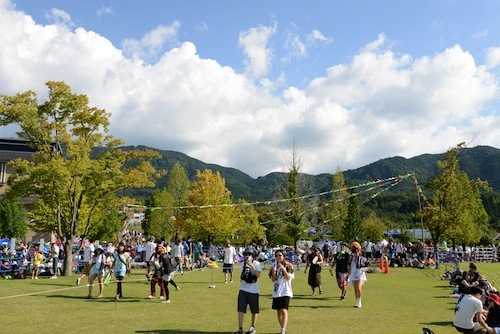 The first day of the festival was blessed by a clear blue sky. Using solar panels, the strong energy of the sun was converted into electricity, and pleasant music could be heard from the stage. There were small children playing on hammocks with their fathers, sliding down roller slides and laughing heartily. But that's not all. Many older people, in their 40s and 50s, who we usually don't see at other festivals, also come to join the fun. 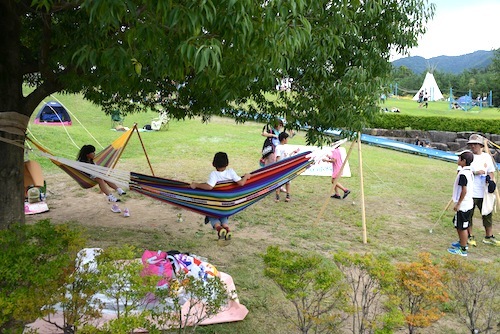 Children enjoying the festival, swaying in the hammock under the shade of a tree. Works of art were created all around the venue. "We carefully, consciously choose participating artists so that people from all age groups would want to attend the festival. For example, last year we asked Aki Yashiro to take part. It's more fun when we have people from different generations. Older men and women feel energized by younger generations, and the younger generation can learn a lot from their elders. Many of the issues we face tend to boil down to a generation gap. That's why we hope our festival will become a place that people of all generations can come and have fun." 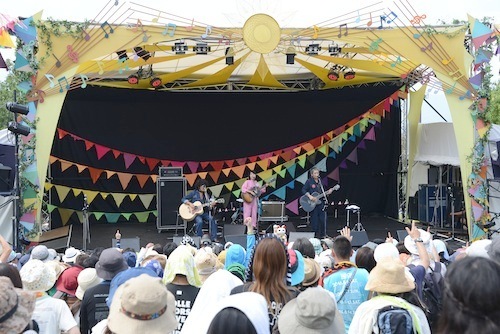 It seemed as though Mr. Taiji Sato is also hoping that people who used to be crazy about the Folk Jamboree would now come and have fun at the "Nakatsugawa THE SOLAR BUDOKAN." And he also wants to encourage participation of kids by making admissions free for up to 2 children in elementary school or younger per guardian. Mr. Taiji Sato is very popular among children, who call him "Mop Hair". (Photograph provided by: THE SOLAR BUDOKAN). A scene from the class Mr. Sato taught. Children drawing enthusiastically on worksheets. (Photograph provided by: THE SOLAR BUDOKAN). There is a group of people who have been taking photographs of the fans at the "Nakatsugawa THE SOLAR BUDOKAN" since 2013. This group, the "Smile is Energy! Project", has become quite famous among the regular participants. Mr. Hideto Yamada (right) and Mr. Tadayuki Aritaka (left) from the Smile is Energy! Project. 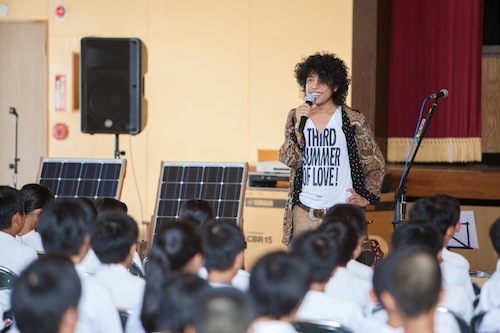 "We want to capture the smiles of people enjoying fantastic music under the sun and share those smiles with everyone so that this would become another positive force that encourages people to think about the potential of solar energy." Smile is Energy! is an art project that captures the smiles of fans, who agree with the above concept, and it then takes those photographs and applies the "Smile is Energy" message color (that gradually changes from yellow to orange). These photographs are then shared on the website with the copy, "Smile is Energy!" The project was launched by Mr. Hideo Yamada (communications designer), Mr. Tadayuki Aritaka (photographer), and "SPREAD" (designer) with the hopes of creating a society full of smiling faces. 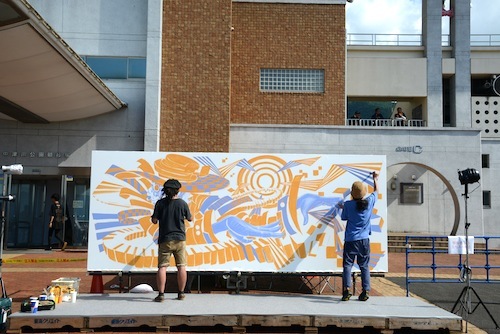 The project originated from Mr. Hideo Yamada's idea, who is originally from Gifu Prefecture, to transform smiles of fans at the festival into some form of energy. "After the Great East Japan Earthquake, I did some research and studied how energy is created, and how it should be used. I also became a father, and so I thought, it wouldn't feel right unless we made the shift to renewable energy. So I started this project hoping that it would provide an opportunity for people to start thinking about the possibilities of renewable energy. What I realized after I started this project is that I didn't meet a single person who frowned and that smiles have great power. This is true of people who have their photos taken and of people who've visited our website. Rather than raising our hands and saying, 'No nukes! ", it's more natural to say, let's think of things that will help us keep smiling, and I think this kind of feeling lasts longer, too." 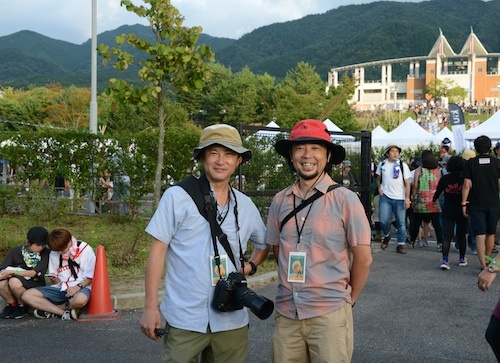 This project takes photographs of willing people at the festival and shares them on the website. Participants aren't asked to stare into the camera. Rather, by capturing their smiling faces while they're enjoying the festival, the group is able to capture natural smiles. This helps get people more deeply involved in the project and encourages people who've had their photos taken to tell others, and at the same time tell them about the potential of renewable energy. And this movement is beginning to have impact on more and more people. "We've found that when we take people's photos and speak to them, many of them know us and say, 'Smile Energy? Wow! This is great!' And so we're starting to have more fun ourselves" said Mr. Tadayuki Aritaka, the photographer. On the Smile is Energy! Project's website you will find photos taken at the FY2016 SOLAR BUDOKAN. By chance, I ran into them while they were taking people's photos. Everyone, regardless of whether they were young girls or older men, was smiling genuinely, and seemed very happy. Of course just having someone capture our beautiful smiles would make us happy, but the "Smile is Energy! 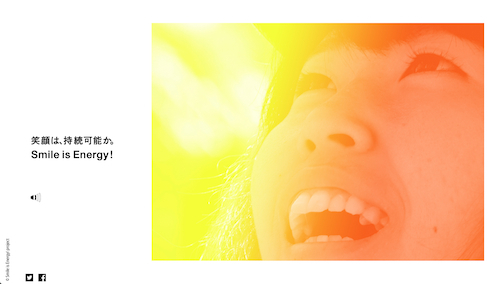 Project" made me realize just how powerful smiles can be. Numerous solar panels. These are the first thing that come into sight once you enter the festival venue. It's easy to say, "Let's have a concert entirely powered by solar energy", but what system is making this possible? At the venue, a total of 517 solar panels were installed, which together produced approximately 445Kw. However, the amount of energy generated changes depending on the weather during the festival. This is where the storage battery comes into play. Storage batteries, fully charged beforehand, were brought in to support the live performances. And stages that need more energy than the storage batteries can provide were backed by bio diesel. Moreover, the buildings and booths were powered by solar power generation that has received the Green-e certified renewable energy certificate. 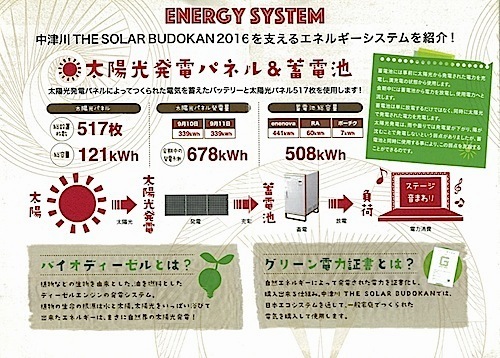 Details of the energy system introduced on the leaflets passed out to festivalgoers. The biggest weakness of solar power generation is that the power output is significantly affected by climate. What happens when we have bad weather? 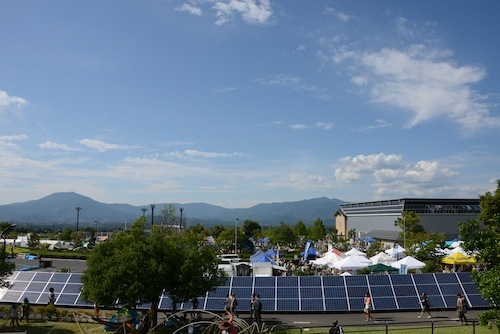 Can the festival be held with just solar panels and storage batteries? 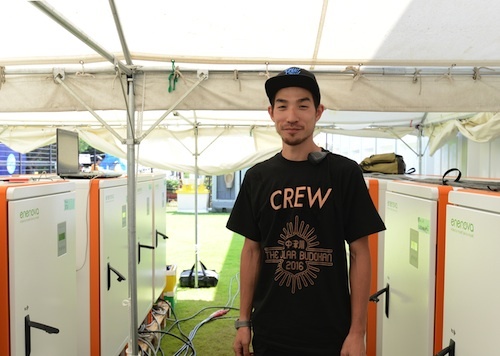 Mr. Tomoaki Murakami from RA -energy design-, in charge of the festival's energy system answered this question. Mr. Tomoaki Murakami from RA -energy design-. Five members including Mr. Murakami build and manage the energy system. "Frankly speaking, we don't have enough solar panels right now. Many people may think that it's the speakers and amps that use a lot of electricity, but the lights actually use far more energy. Audio equipment have evolved significantly over the years, and they don't consume as much power nowadays. 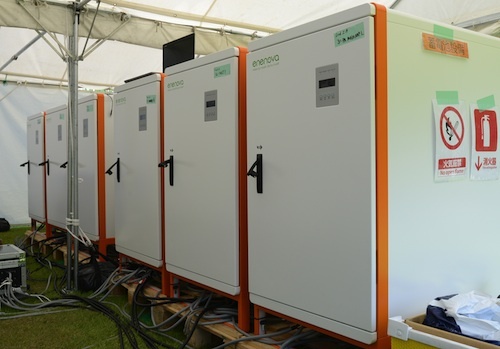 That's why we think that if it were just audio equipment, we could power music festivals all around the world with solar panels and storage batteries." 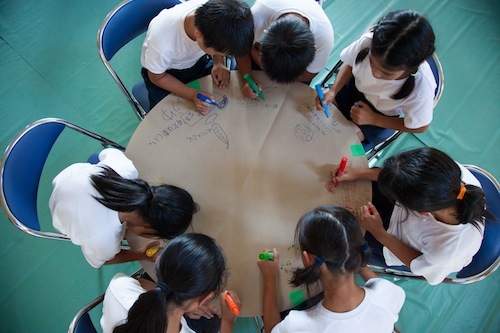 "The technology is quite simple, so even a grade school student could put it together. There are only 4 components to the system: solar panels, storage batteries, charge controllers to charge the batteries, and inverters that convert direct current to alternate current. Each stage is equipped with this system. So not only do we want to say, 'Solar power is great! ', we actually really want to say, 'It's also very simple, so why not give it a try?!'" 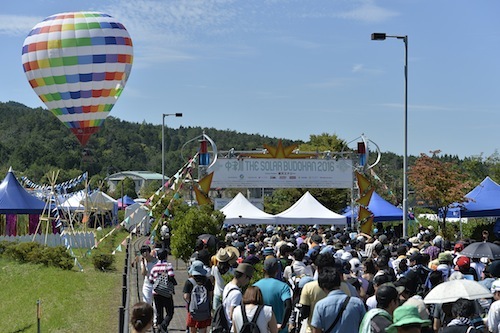 Until I spoke to Mr. Murakami, I had thought that powering an outdoor festival with only renewable energy was technologically very difficult, but now I know different. Rows and rows of solar panels set up besides the main stage, the Revolution Stage. 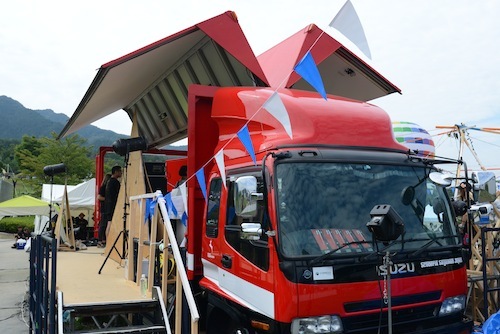 They used a solar truck that could quickly transform into a stage as the Realize Stage. "We wanted to power at least this stage entirely with storage batteries! So from the first year, we stored energy created by the sun and powered 100% of this stage with storage batteries." So explained Mr. Koji Fujita from RA -energy design-, who planned the power system including the power supply for lighting, this year. Mr. Koji Fujita of RA -energy design-. Being himself a sound engineer, he wanted to ensure that the best sound would be delivered on stage. Rows of storage batteries back stage. They look as large as professional refrigerators, but how much energy can these supply? "The type of power cables we're using for this stage are type C connectors supporting 30A (amps). And we've combined cables with a thickness and capacity to withstand 3,000W. And we've got 12 sets of these, so we are supplying 36,000W (watts) total, but on average, we don't use that much energy." Storage batteries behind the Redemption Stage. I also asked about the key differences in creating a traditional power system and one that uses storage batteries. "Usually, stage engineers ask for 'x many 30Amps, 10 on stage left and 4 on stage R,' for example, but with storage batteries it's a little bit more complicated. Of course we have 30A compatible standards, but amps and audio equipment can output up to 4,000-5,000W at their peak. This instantaneous increase in current is referred to as inrush current, but with storage batteries, power is created through chemical reaction, so there's a slight time lag from when the equipment demands power and when power is supplied. It's easy to steadily supply 3,000W, but it's difficult to immediately respond to fluctuating demand in energy, such as to the volume increase and decrease of amps." I mentioned a time lag, but it's actually less than 1 second. However for musicians, even a second is too long. So Mr. Fujita thought of a way to reduce this time lag to virtually zero. For example, he took a closer look at the difference in the quality and performance of batteries. In comparison to lead-acid batteries, lithium-ion batteries excel in creating and supplying energy instantly. Moreover, he placed capacitors between the batteries and the inverters, and by constantly supplying and storing energy in capacitors the system could now meet temporary peak demand. 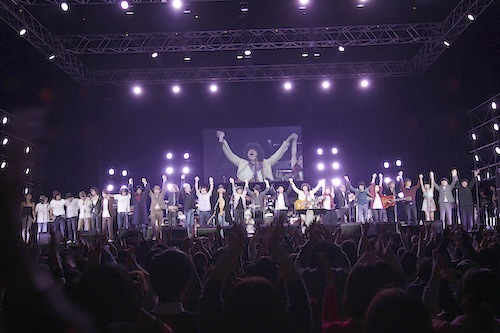 Many people gathered in front of the Redemption Stage in anticipation of the performance. At events, where there is an infinite supply of energy and all you have to do is plug your equipment in, you don't think about how much energy you're going to be using. But when you have storage batteries as a power source, sound and lighting engineers have to be mindful of how much energy can be used and think of ways to use energy efficiently. Depending on how you look at this, this could be considered as something negative, as a constraint, or transformed into a positive idea. "Right now, energy in Japan is created based on everyone's 'wants'. And the number of power plants we have is a reflection of these 'wants'. But I think we need to have a better idea about how much energy we really need. After the Great East Japan Earthquake, everyone said, 'Let's save energy!' but we didn't know in how we should save energy and how much impact that would have. I think in order to save energy we should first learn how much energy our PCs and TVs consume. Let's say, there's a bucket full of energy, and if we could see it becoming more empty the more energy we use, we'd naturally begin to think, 'I'm using too much energy. I should start saving.' We should take the initiative and evolve ourselves, rather than waiting for technology to evolve. We need to version upgrade ourselves so that we can start using energy more wisely." Solar panels and audio equipment are becoming more and more energy efficient, and someday, state-of-the-art technology will solve the energy issues we are facing. Having said that, do we really need to use as much energy as we are using? We live a very comfortable life, and we continue to seek for better convenience and efficiency. It's become normal to have unlimited access to energy. But perhaps now is the time to reexamine this way of thinking. "For the first time this year, we powered the lights with solar energy, but it made us realize that there's still some elbow room, so next year we hope to create a richer stage with twice as much lights. And another goal we have is have more stages that are fully solar. Ultimately, we hope to power some of the main stages with 100% solar energy." Mr. Fujita described his next goals. The day that every stage will become fully solar may not be so far away. 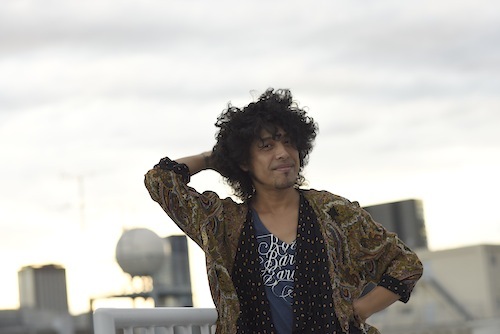 Although many popular artists such as ACIDMAN, Dragon Ash, and 10-FEET, who empathized with Mr. Taiji Sato's passion and aspirations, participate in the "Nakatsugawa THE SOLAR BUDOKAN," there are some that declined to take part because of its strong concept and message. But in some ways, may be that was the right decision. When you take a step inside the festival, you immediately understand what kind of place it is. On every stage you hear Mr. Taiji Sato's name, and the venue is filled with respect for him. You can't stand on this stage half-heartedly. "Nakatsugawa THE SOLAR BODUKAN" is a treasured place, where artists can perform without feeling any guilt, all looking in the same direction, communicating one message. 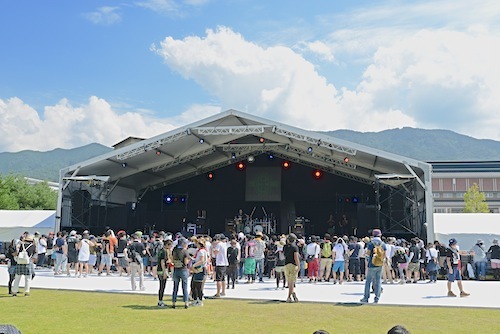 Day 2, on the Respect Stage, Mr. Taiji Sato, the executive director of the "Indies Energy Big Board Meeting", Hitomi Yaida and other one-day presidents enlivened the stage. In between the live performances, the fans enjoyed spending time, each in their own way. Theatre Brook was the final performance of the first day. Mr. Taiji Sato's voice touched many hearts and created a great wave. 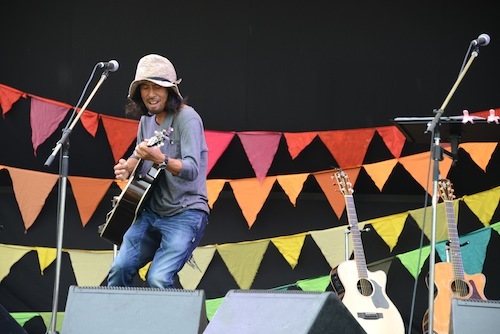 I asked artist, Mr. Tomohiro Higashida, who has had a lot of experience performing at different festivals and live events, about the difference between the SOLAR BUDOKAN and other festivals. 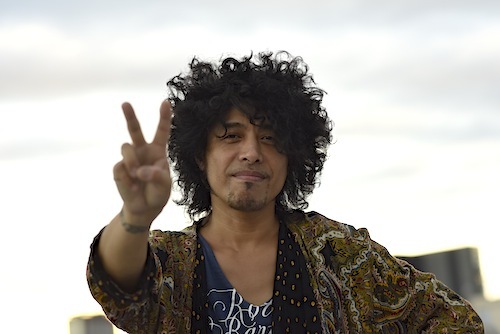 "Taiji-san asked me to take part, and this is the first time I performed at the festival, but it was really peaceful and both the participating artists and the crowd seemed well balanced. There were artists and fans from a wide range of music genres. And the crowds were older than the outdoor festivals I'm used to, so that made me happy. Some people in the crowd went wild when I covered one of Neil Young's songs, so I think there were many people there who love old foreign music. 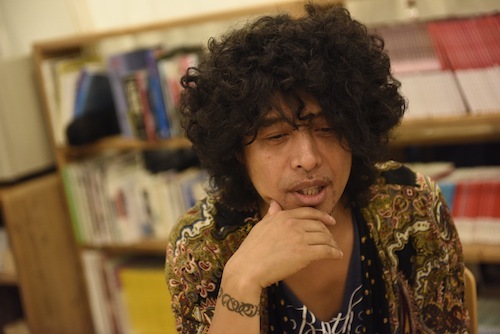 Taiji-san is also well versed with roots music, so I'm sure people are probably projecting Taiji-san's personality, as well. And this festival also treats the participating artists equally. That's probably why our feelings get across and the fans also feel comfortable." Mr. Tomohiro Higashida talked about the Kumamoto Earthquake during the talk show. He started the Kumamoto recovery project, "Hallelujah Kumamoto", and is providing aid to people afflicted by the earthquake. After the Great East Japan Earthquake, Mr. Higashida installed solar panels on his roof, and is now creating 40% of energy he uses with sunlight. Having put together the solar panels and installed and wired them himself, he felt that what they were doing at the "Nakatsugawa THE SOLAR BUDOKAN" was much the same. "Taiji-san does things on an enormous scale, so that's why this house (scale) is so huge" said Mr. Higashida with a smile. What Mr. Taiji Sato is doing would be extremely difficult to replicate. But there is a lot that we can do as individuals. Like Mr. Higashida, we could install solar panels at home, buy electricity from power companies we trust, and start saving money by saving electricity. "Like me, if you want to create energy at home, and you have the environment to set it up, of course that's an option, but it's not necessary for all of us to choose solar energy because, as is the case with many things, we have a lot of options to choose from. When children get bullied in school, and they commit suicide, it's because they can only think of one way out. In today's media and society, human relationships are built on a pyramid-shaped hierarchy, but there is no hierarchy among people. And it is our job as musicians to open hearts and souls that are normally closed." Mr. Higashida sang in a beautiful voice on the Respect Stage. In Japan today, it is quite difficult to talk face-to-face about energy issues, and take one wrong step and you become someone that is a little unapproachable. But don't you think music is a positive, natural, and most optimal way to communicate? It has the potential to get people who like music, but who aren't so interested in energy thinking differently. 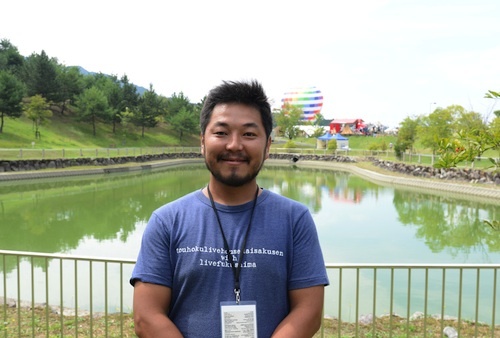 Mr. Higashida hopes for peace, loves nature, and lives a sustainable lifestyle with his feet on the ground. And I felt strongly that his way of life had transformed into his music, to his lyrics, delivering his messages to a great many people. Have you ever seen a TV program about the Great East Japan Earthquake, felt a little down, and changed the channel? Five years from the earthquake, at a glance, our lives seem to have gone back to normal, and our memory of the disaster has already begun to fade. When 3.11 happened, we watched the tsunami swallow up the coastline, listened to people who lost their families and friends, and felt uncertain, uneasy as we experienced blackouts. At times, it's important to forget. But there are things we shouldn't forget. Because of 3.11, many people began to think about energy. That goes for me, as well. We shouldn't repeat our mistakes. I am sure many people felt this way. "Nakatsugawa THE SOLAR BUDOKAN" is not an anti-nuclear movement. Rather, it is a pro natural energy movement. That is why many people have empathized with what it stands for, that is why it has grown, and that is also why it has started to develop wings of its own. "THE SOLAR BUDOKAN is growing rapidly. It's a big project for me, too, and I feel a sense of accomplishment that together we've gotten so far, and because of the experience, we have the confidence to continue. Recently, what I often say is that music is peace. This is the truth, and that's why THE SOLAR BUDOKAN makes sense. What music represents and feelings towards peace has fit together perfectly. If you don't act, you won't feel fulfilled. When I say act, it can be something as simple as, continuing to take part in THE SOLAR BUDOKAN." When I asked Mr. Taiji Sato about the next challenge, he said without hesitation. 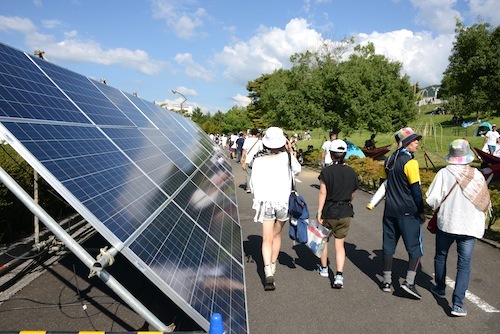 "Making Tokyo 2020 Olympic and Paralympic Games a solar Games. Sports with all that running and jumping uses far less energy than music!" By the end of the interview, I was in complete awe of his strong belief and the scale of his ideas. And most importantly, it was "iikagen" or just right, perfect that Mr. Taiji Sato enjoys this project. In Japanese, "iikagen" can also have a negative connotation meaning inaccurate, ill conceived, but Mr. Taiji uses this word in a positive sense. Solar panels have become part of the scenery of THE SOLAR BUDOKAN. The day that this becomes normal for outdoor festivals may be right around the corner. Everyone I interviewed said, "One day it will be normal to power outdoor festivals with renewable energy. We hope we will see such a society come to life." I hope that Mr. Taiji Sato will continue to lead the way and introduce different possibilities to a great many people. By next year, I am sure that THE SOLAR BUDOKAN will have evolved even further.